With 6 equal oversized master bedroom suites, a pool and two hot tubs, this classic estate is the perfect large party rental and generates substantial income, while providing a retreat for the owners and their extended family in one home. Flawless layout, Central AC throughout, total privacy, easy North Shore and Town access, an oversized waterfront lot in a desirable neighborhood, spectacular sunset views from every bedroom, parking, a private and easy staircase to the beach, the large pool and huge patio, mature professional landscaping, 2 full size gourmet kitchens,…the list goes on and on for this turnkey property. Possible owner financing available. The home and property is thoughtfully designed to allow for use as TWO completely separate villas or easily combined as one. With a $1M renovation in 2007, this classic home has the modern touches that make a luxury property perfect for entertaining, relaxing and connecting with friends and family. The large common areas and 6 equal 650 sq ft bedroom suites that include: private balconies, refrigerator, walk-in closets, walk-in showers, two person Jacuzzi bathtubs, and individually controlled AC; thereby offering something few homes on St John do; the ability to be in the same home and still have complete privacy from your guests and family, without anyone having an inferior room. 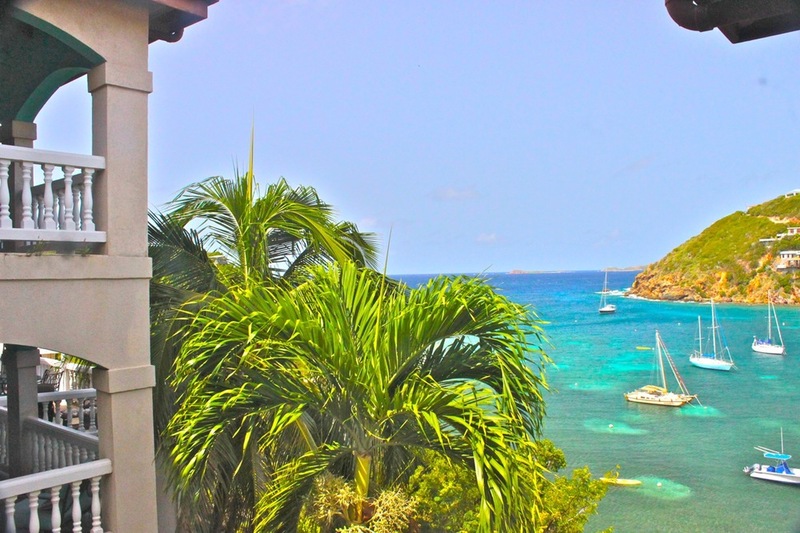 Gorgeous sunset views of Chocolate Hole, St. Thomas and the Caribbean Sea from every room. · Extra Large Salt purified pool and 2 hot tubs surrounded by paver patio overlooking the sea. 12 lounge chairs line the crystal clear pool to soak in the sun between swims. Poolside changing room, outdoor shower and bathroom. 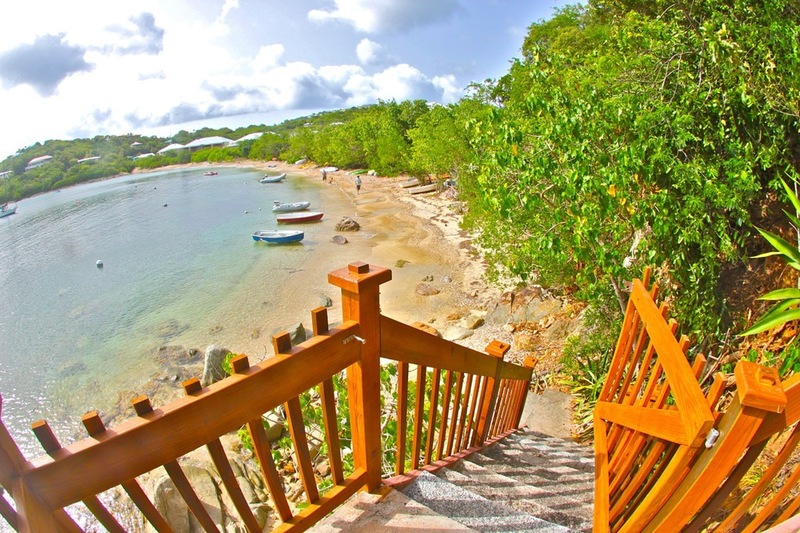 · Easy to use stairs to the beach for access to swimming, snorkeling and watercraft. · Waterfront to Chocolate Hole, a quality anchorage and mooring area for a large boat. · Mediterranean Tile Roof and Masonry Construction. · Parking for 5 cars without blocking in. More if needed in driveway. · Over 70,000 gallons of UV filtered drinking water in Masonry Cisterns in two separate systems. Well designed for easy water management. · Huge lockable linen/housekeeping storage room. Separate lockable maintenance storage room. Separate lockable owner’s closets. · Impressive Rental income with Big Party Niche Market. Powerful and coveted URL and website www.villastjohn.com included in sale. · Amazing, easy access location is on the beach, close to town and close to the National Park Beaches. · Great Room Featuring 20 foot stone accent wall under Cyprus cathedral ceiling with picture windows to the azure reefs of Chocolate Hole. · Large tiled great room under cyprus cathedral ceilings. Brazillian Cherry stairs to lower level. 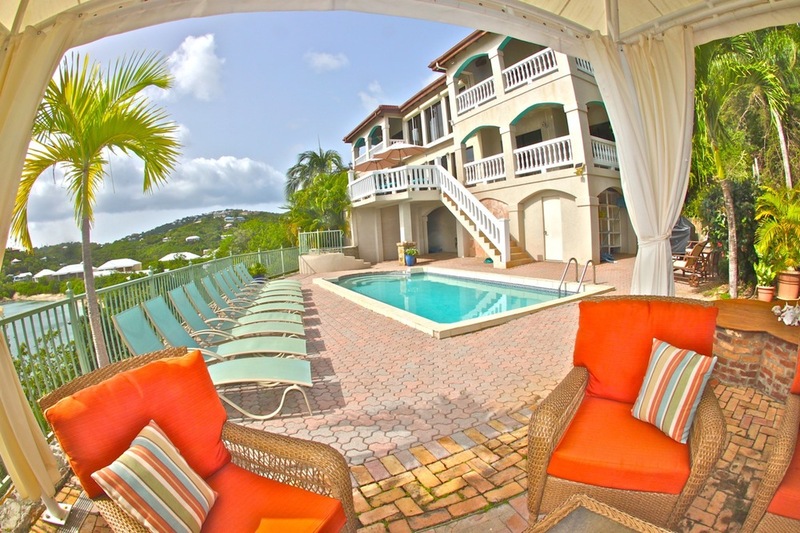 · Easy access to Pool, Hot Tub’s and other villa when wanted.